A four-member Board of Directors, made up of representatives from the NYS Governor's Office of Employee Relations and CSEA, provides policy guidance to the Partnership. 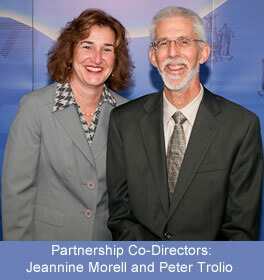 Co-Directors Jeannine Morell and Peter Trolio oversee the Partnership's programs and services. The Partnership's programs and services continue to invest in the job skills needed by employees and offer innovative approaches for enhancing labor-management relations. Field Services - Support the Partnership's mission in building effective labor-management relationships between agency/facility managers and CSEA leaders. Field staff are often the important first link for CSEA and management representatives seeking both information and assistance from the Partnership. Field staff promote Partnership programs and services through presentations, meetings, and informational events. Provided statewide by three Field Associates who promote the Partnership's mission in building effective labor-management relationships between NYS managers and CSEA leaders. Field Associates are often the important first link for CSEA and management representatives seeking both information and assistance from the Partnership.